"Fish n' chips" redirects here. For other topics, see Fish 'n' Chips (disambiguation). Fish and chips is a hot dish of English origin consisting of fried fish in batter served with chips. It is a common take-away food in the United Kingdom and an early example of culinary fusion. Fish and chips first appeared in the UK in the 1860s. By 1910 there were more than 25,000 fish and chip shops across the UK, and by the 1930s there were over 35,000, falling to about 10,000 by 2009. Fish and chips are now a staple takeaway meal in numerous countries, particularly in English-speaking and Commonwealth countries. A standard serving of fish and chips with a slice of lemon and side of greenery. The tradition in the UK of fish battered and fried in oil may have come from Jewish immigrants from Spain and Portugal. Originally, Western Sephardic Jews settling in England as early as the 16th century would have prepared fried fish in a manner similar to pescado frito, which is coated in flour then fried in oil. Charles Dickens mentions "fried fish warehouses" in Oliver Twist (1838), and in 1845 Alexis Soyer in his first edition of A Shilling cookery for the People, gives a recipe for "Fried fish, Jewish fashion", which is dipped in a batter of flour and water. 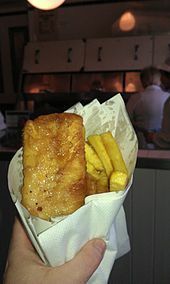 Fish and chips, served in a paper wrapper (greaseproof paper inner and ordinary paper outer), as a "takeaway"
The exact location of the first fish and chip shop is unclear. The earliest known shops were opened in the 1860s, in London by Joseph Malin and in Mossley, near Oldham, Lancashire, by John Lees. However, fried fish, as well as chips, had existed independently for at least fifty years, so the possibility that they had been combined at an earlier time cannot be ruled out. Fish and chips became a stock meal among the working classes in England as a consequence of the rapid development of trawl fishing in the North Sea, and the development of railways which connected the ports to major industrial cities during the second half of the 19th century, so that fresh fish could be rapidly transported to the heavily populated areas. Deep-fried chips (slices or pieces of potato) as a dish may have first appeared in England in about the same period: the Oxford English Dictionary notes as its earliest usage of "chips" in this sense the mention in Charles Dickens' A Tale of Two Cities (1859): "Husky chips of potatoes, fried with some reluctant drops of oil". The modern fish-and-chip shop ("chippy" or "chipper" in modern British slang) originated in the United Kingdom, although outlets selling fried food occurred commonly throughout Europe. Early fish-and-chip shops had only very basic facilities. Usually these consisted principally of a large cauldron of cooking fat, heated by a coal fire. The fish-and-chip shop later evolved into a fairly standard format, with the food served, in paper wrappings, to queuing customers, over a counter in front of the fryers. By 1910, there were more than 25,000 fish and chip shops across the country, and in the 1920s there were more than 35,000 shops. As a boy Alfred Hitchcock lived above a fish and chip shop in London, which was the family business. According to Professor John Walton, author of Fish and Chips and the British Working Class, the British government made safeguarding supplies of fish and chips during World War I a priority: "The cabinet knew it was vital to keep families on the home front in good heart, unlike the German regime that failed to keep its people well fed". In 1928, Harry Ramsden opened his first fish and chip shop in Guiseley, West Yorkshire. On a single day in 1952, the shop served 10,000 portions of fish and chips, earning a place in the Guinness Book of Records. In George Orwell's The Road to Wigan Pier (1937), which documents his experience of working class life in the north of England, the author considered fish and chips chief among the 'home comforts' which acted as a panacea to the working classes. During World War II, fish and chips remained one of the few foods in the United Kingdom not subject to rationing. Prime Minister Winston Churchill referred to the combination of fish and chips as "the good companions". John Lennon enjoyed his fish and chips—a staple of the working class—smothered in ketchup. British fish and chips were originally served in a wrapping of old newspapers but this practice has now largely ceased, with plain paper, cardboard, or plastic being used instead. In the United Kingdom, the Fish Labelling Regulations 2003 and in Ireland the European Communities (Labelling of Fishery and Aquaculture Products) Regulations 2003  respectively enact directive 2065/2001/EC, and generally mean that "fish" must be sold with the particular commercial name or species named; so, for example, "cod and chips" now appears on menus rather than the more vague "fish and chips". In the United Kingdom the Food Standards Agency guidance excludes caterers from this; but several local Trading Standards authorities and others do say it cannot be sold merely as "fish and chips". Fish and chips, as served in a British restaurant. A prominent meal in British culture, the dish became popular in wider circles in London and South East England in the middle of the 19th century: Charles Dickens mentions a "fried fish warehouse" in Oliver Twist, first published in 1838, while in the north of England a trade in deep-fried chipped potatoes developed. The first chip shop stood on the present site of Oldham's Tommyfield Market. It remains unclear exactly when and where these two trades combined to become the fish-and-chip shop industry we know. A Jewish immigrant, Joseph Malin, opened the first recorded combined fish-and-chip shop in London in 1860 or in 1865; a Mr Lees pioneered the concept in the North of England, in Mossley, in 1863. The concept of a fish restaurant, as opposed to take-away, was introduced by Samuel Isaacs (born 1856 in Whitechapel, London; died 1939 in Brighton, Sussex) who ran a thriving wholesale and retail fish business throughout London and the South of England in the latter part of the 19th century. Isaacs' first restaurant opened in London in 1896 serving fish and chips, bread and butter, and tea for nine pence, and its popularity ensured a rapid expansion of the chain. The restaurants were carpeted, had table service, tablecloths, flowers, china and cutlery, and made the trappings of upmarket dining affordable to the working classes for the first time. They were located in Tottenham Court Road, St Pancras, The Strand, Hoxton, Shoreditch, Brixton and other London districts, as well as Clacton, Brighton, Ramsgate, Margate and other seaside resorts in southern England. Menus were expanded in the early 20th century to include meat dishes and other variations as their popularity grew to a total of thirty restaurants. Sam Isaacs' trademark was the phrase "This is the Plaice", combined with a picture of the punned-upon fish in question. A glimpse of the old Brighton restaurant at No.1 Marine Parade can be seen in the background of Norman Wisdom's 1955 film One Good Turn just as Wisdom/Pitkin runs onto the seafront; this is now the site of a Harry Ramsden's fish and chips restaurant. 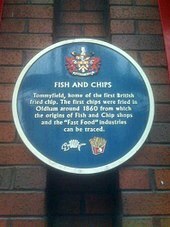 A blue plaque at Oldham's Tommyfield Market marks the first chips fried in England in 1860, and the origin of the fish and chip shop and fast food industries. Dundee City Council claims that chips were first sold by a Belgian immigrant, Edward De Gernier, in the city's Greenmarket in the 1870s. In Edinburgh, a combination of Gold Star brown sauce and water or malt vinegar, known as "sauce", or more specifically as "chippy sauce", has great popularity; salt and vinegar is preferred in Glasgow, often prompting light-hearted debate on the merits of each option among the cities' residents who tend to find the alternative a baffling concept. The annual National Fish & Chips Awards were set up in the UK in 1988. The 30th Annual Fish & Chips Awards ceremony was attended by Norwegian ambassador to the UK Mona Juul. In Ireland, the first fish and chips were sold by an Italian immigrant, Giuseppe Cervi, who mistakenly stepped off a North American-bound ship at Queenstown (now Cobh) in County Cork in the 1880s and walked all the way to Dublin. He started by selling fish and chips outside Dublin pubs from a handcart. He then found a permanent spot in Great Brunswick Street (now Pearse Street). His wife Palma would ask customers "Uno di questa, uno di quella?" This phrase (meaning "one of this, one of that") entered the vernacular in Dublin as "one and one", which is still a way of referring to fish and chips in the city. Fish and chips is the most popular takeaway food in New Zealand. Food historians have been unable to pinpoint exactly when the meal became an established part of New Zealand cuisine but all recognise that the first fish and chips shops were introduced by British settlers before World War I. During the 20th century, nearly every small town and suburb in New Zealand had at least one fish-and-chip shop. As in Britain, Friday night has been the traditional night to eat fish. Traditionally, fish and chips were served in wrappings of newspaper. With the decline of the newspaper industry, this has become less common. In 1980, four up-and-coming Labour Party politicians, including David Lange, were nicknamed the "Fish and Chip Brigade" due to a picture published at the time with the group eating fish and chips. 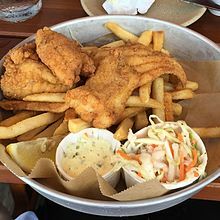 In the United States, the dish is most commonly sold as fish and chips, except in Upstate New York and Wisconsin and other parts of the Northeast and Upper Midwest, where this dish would be called a fish fry. Despite the name fish and chips, and the US meaning of chips as potato chips, the dish is served with french fries (much thinner than British and Irish chips). However, some restaurants will use thicker french fries which are known as steak fries. These fries are closer to British chips. In the Southern United States, a common form of cuisine is fried catfish with french fries, accompanied by coleslaw, pickles, raw onion slices and lemon slices. Traditional frying uses beef dripping or lard; however, vegetable oils, such as peanut oil (used because of its relatively high smoke point) now[update] predominate. A minority of vendors in the North of England and Scotland, and the majority of vendors in Northern Ireland, still use dripping or lard, as it imparts a different flavour to the dish, but this makes the fried chips unsuitable for vegetarians and for adherents of certain faiths. Lard is used in some living industrial history museums, such as the Black Country Living Museum. All fish is filleted, no bones should be found in the fish. British and Irish chips are usually thicker than American-style french fries. In their homes or in some restaurants, people in or from the United States may eat a thick type of chip, more similar to the British and Irish variant, sometimes referred to as steak fries. In Britain and Ireland, fish and chip shops traditionally use a simple water and flour batter, adding a little sodium bicarbonate (baking soda) and a little vinegar to create lightness, as they react to create bubbles in the batter. Other recipes may use beer or milk batter, where these liquids are often substitutes for water. The carbon dioxide in the beer lends a lighter texture to the batter. Beer also results in an orange-brown colour. A simple beer batter might consist of a 2:3 ratio of flour to beer by volume. The type of beer alters the taste of the batter; some prefer lager whereas others use stout or bitter. In Britain and Ireland, cod and haddock appear most commonly as the fish used for fish and chips, but vendors also sell many other kinds of fish, especially other white fish, such as pollock or coley, plaice, skate, and ray (particularly popular in Ireland); and huss or rock salmon (a term covering several species of dogfish and similar fish). 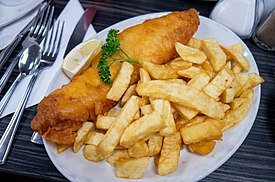 In Northern Ireland, cod, plaice or whiting appear most commonly in 'fish suppers'—'supper' being Scottish and Northern Irish chip-shop terminology for a food item accompanied by chips. Suppliers in Devon and Cornwall often offer pollock and coley as cheap alternatives to haddock. In Australia, reef cod and rock cod (a different variety from that used in the United Kingdom), barramundi or flathead (more expensive options), flake (a type of shark meat), King George Whiting (little more expensive than other fish, but cheaper than Barramundi or Flathead) or snapper (cheaper options), are commonly used. From the early 21st century, farmed basa imported from Vietnam and hoki have become common in Australian fish and chip shops. Other types of fish are also used based on regional availability. In New Zealand, snapper or gurnard was originally the preferred species for battered fillets in the North Island. As catches of this fish declined, it was replaced by hoki, shark (particularly rig) – marketed as lemon fish – and tarakihi. Bluefin gurnard and blue cod predominate in South Island fish and chips. In the United States, the type of fish used depends on availability in a given region. Some common types are cod, halibut, flounder, tilapia or, in New England, Atlantic cod or haddock. Salmon is growing common on the West Coast, while freshwater catfish is most frequently used in the Southeast. In India, the dish is usually based on pomfret fish, and uses chilli paste, and more pepper than would be used in Britain. In Ireland, Wales and England, most takeaways serve warm side portions of sauces such as curry sauce, gravy or mushy peas. The sauces are usually poured over the chips. In some areas, this dish without fish is referred to as 'wet chips'. In the Midlands especially, chips with mushy peas or baked beans is known as a "pea mix" or a "bean mix". Other fried products include 'scraps' (also known as 'bits' in Southern England and "scrumps" in South Wales), originally a by-product of fish frying. Still popular in Northern England, they were given as treats to the children of customers. Portions prepared and sold today consist of loose blobs of batter, deep fried to a crunchy golden crisp in the cooking-fat. The potato scallop or potato cake consists of slices of potato dipped in fish batter and deep fried until golden brown. These are often accompanied for dipping by the warm sauces listed above. There are distinct regional variations in how accompaniments are added to the meal where it is as a take away – related partly to whether the food is entirely wrapped in paper. In some shops the customer is expected to add these; in others the expectation is that the server does so. An average serving of fish and chips consisting of 6 ounces (170 grams) of fried fish with 10 ounces (280 grams) of fried chips has approximately 1,000 calories and contains approximately 52 grams of fat. The use of tartar sauce as a condiment adds more calories and fat to the dish. In the United Kingdom, Ireland, Australia, Canada, New Zealand and South Africa, fish and chips are usually sold by independent restaurants and take-aways known as fish and chip shops. Outlets range from small affairs to chain restaurants. Locally owned seafood restaurants are also popular in many places, as are mobile "chip vans". In Canada, the outlets may be referred to as "chip wagons". In the United Kingdom some shops have amusing names, such as "A Salt and Battery", "The Codfather", "The Frying Scotsman", "Oh My Cod" and "Frying Nemo" In New Zealand and Australia, fish-and-chip vendors are a popular business and source of income among the Asian community, particularly Chinese migrants. In Indonesia, fish and chips are commonly found in big cities like Jakarta in western and seafood restaurants, as well as chain restaurants like The Manhattan Fish Market, Fish & Chips etc. In Ireland, the majority of traditional vendors are migrants or the descendants of migrants from southern Italy. A trade organisation exists to represent this tradition. Fish and chips is a popular lunch meal eaten by families travelling to seaside resorts for day trips who do not bring their own picnic meals. Fish-and-chip outlets sell roughly 25% of all the white fish consumed in the United Kingdom, and 10% of all potatoes. The numerous competitions and awards for "best fish-and-chip shop" testify to the recognised status of this type of outlet in popular culture. Fish-and-chip shops traditionally wrapped their product in newspaper, or with an inner layer of white paper (for hygiene) and an outer layer of newspaper or blank newsprint (for insulation and to absorb grease), though the use of newspaper for wrapping has almost ceased on grounds of hygiene. Nowadays[update], establishments usually use food-quality wrapping paper, occasionally printed on the outside to imitate newspaper. The British National Federation of Fish Friers was founded in 1913. It promotes fish and chips and offers training courses. A previous world record for the "largest serving of fish and chips" was held by Gadaleto's Seafood Market in New Paltz, New York. This 2004 record was broken by Yorkshire pub Wensleydale Heifer in July 2011. An attempt to break this record was made by Doncaster fish and chip shop Scawsby Fisheries in August 2012, which served 33 pounds (15 kg) of battered cod alongside 64 pounds (29 kg) of chips. The long-standing Roman Catholic tradition of not eating meat on Fridays, especially during Lent, and of substituting fish for meat on that day continues to influence habits even in predominantly Protestant, Anglican, semi-secular and secular societies. Friday night remains a traditional occasion for eating fish-and-chips; and many cafeterias and similar establishments, while varying their menus on other days of the week, habitually offer fish and chips every Friday. In Australia and New Zealand, the words "fish and chips" are often used as a shibboleth to highlight the difference in each country's short-i vowel sound /ɪ/. Australian English has a higher forward sound [i], close to the ee in see (but shorter), while New Zealand English has a lower backward sound [ɘ] akin to the a in Rosa's (but not in Rosa, which is typically lower [ɐ]). Thus, New Zealanders hear Australians say "feesh and cheeps," while Australians hear New Zealanders say "fush and chups." In the UK, waste oil from fish and chip shops has become a useful source of biodiesel. The German biodiesel company Petrotec has outlined plans to produce biodiesel in the UK from waste oil from the British fish-and-chip industry. Chicken and chips – another take-away dish often sold in the same establishments. ^ Black, Les (1996). New Ethnicities and Urban Culture. Oxford: Routledge. p. 15. ISBN 1-85728-251-5. Retrieved 14 February 2019. ^ a b c d e f g Alexander, James (18 December 2009). "The unlikely origin of fish and chips". BBC News. Retrieved 16 July 2013. ^ Roden, Claudia (1996). The Book of Jewish Food: An Odyssey from Samarkand to New York. Knopf. ISBN 9780394532585 – via Google Books. ^ Hosking, Richard (2007). Eggs in Cookery:Proceedings of the Oxford Symposium of Food and Cookery 2006. United Kingdom: Prospect Books. p. 183. ISBN 978-1-903018-54-5. ^ Marks, Gil (1999). The world of Jewish cooking: more than 500 traditional recipes from Alsace to Yemen. Simon & Schuster. ISBN 0-684-83559-2. ^ "Chip-Shop Fried Fish". The Foods of England Project. Retrieved 23 June 2016. ^ Rayner, Jay (3 November 2005). "Enduring Love". The Guardian. London. Retrieved 19 January 2003. In 1860 a Jewish immigrant from Eastern Europe called Joseph Malin opened the first business in London's East End selling fried fish alongside chipped potatoes which, until then, had been found only in the Irish potato shops. ^ Hyslop, Leah (30 October 2013). "Potted histories: fish and chips". ISSN 0307-1235. Retrieved 4 September 2018. ^ "Federation of Fish Friers - Serving the Fish and Chips Industry - History". www.federationoffishfriers.co.uk. Retrieved 4 September 2018. ^ Davidson, Alan (21 August 2014). The Oxford Companion to Food. OUP Oxford. ISBN 9780191040726 – via Google Books. ^ "Did fish and chips come from the north of England?". BBC Radio 4. ^ "Fish and chips - A great English tradition". Archived from the original on 16 January 2008. Retrieved 22 June 2009. ^ "Chippy smells of chips complaint". BBC News. 7 November 2006. Retrieved 22 June 2009. ^ a b Hegarty, Shane (3 November 2009). "How fish and chips enriched a nation". The Irish Times. Dublin, Ireland. p. 17. ^ a b c "The Portuguese gave us fried fish, the Belgians invented chips but 150 years ago an East End boy united them to create The World's Greatest Double Act". Daily Mail. Retrieved 21 September 2011. ^ McGilligan, Patrick (2003). Alfred Hitchcock: A Life in Darkness and Light. p. 13. Regan Books. ^ "Resources for Learning, Scotland: Rationing". Rls.org.uk. 5 January 1998. Retrieved 22 June 2009. ^ "European Communities (Fish Labelling) Regulations, 2003" (PDF). Retrieved 16 October 2012. ^ Chaloner, W. H.; Henderson, W. O. (1990). Industry and Innovation: Selected Essays. Taylor & Francis. ISBN 0-7146-3335-6. ^ Historic uk - the heritage accommodation guide. "Tradition Historic UK, Fish and Chips". Historic-uk.com. Retrieved 22 June 2009. ^ "Dundee Fact File". Dundee City Council. Archived from the original on 8 April 2007. Retrieved 20 March 2007. ^ "Did You Know?". Federation of Fish Friers. Archived from the original on 23 September 2008. Retrieved 22 June 2009. ^ "Scotland's sauce wars: Charge for ketchup in Edinburgh leaves customer from Glasgow with chip on shoulder". The Independent. 27 August 2013. Retrieved 22 March 2019. ^ "Glasgow chippies get ready for the 'salt and sauce' Scottish Cup Final". Daily Record. 18 April 2012. Retrieved 22 March 2019. ^ "Salt 'n' sauce? Capital chippy sauce export bid". Edinburgh Evening News. 6 April 2013. Retrieved 22 March 2019. ^ "Karen Gillan wants Scottish chip sauce – so, what is it?". Radio Times. 18 June 2015. Retrieved 22 March 2019. ^ "Fish & Chips Awards Official Website". Retrieved 2 February 2018. ^ A Orlova, Tamara; Alvarez, Joe (25 January 2018). "Chip Chip Hooray! The National Fish & Chip Awards Names The UK's Best Chippy". Ikon London Magazine. Retrieved 2 February 2018. ^ "National Fish and Chips Day: Thank cod for Giuseppe". Irish Independent. ^ a b c Wassilieff, Maggy (12 June 2006). "Seafood - Favourite Kiwi fare". Te Ara - the Encyclopedia of New Zealand. Retrieved 15 December 2017. ^ "Seafood - Favourite Kiwi fare: The Fish and Chip Brigade". Te Ara - the Encyclopedia of New Zealand. Retrieved 14 December 2017. ^ "Shore Lunch: More Than the World's Finest Fish and Chips – New West". newwest.net. New West Publications. Retrieved 15 December 2017. ^ a b "Chips, fries or crisps? The internet is divided over potato snack names". The Independent. Retrieved 23 March 2019. In line with British terminology, the chunky, thick, fried and floury variety should be called chips. Meanwhile, the slimmer and crispier options - a staple in fast food restaurants and American diners - are fries. ^ "Deep fried fish in beer". Retrieved 23 March 2009. ^ Hix, Mark (26 January 2008). "Gurnard in beer batter". The Independent. London. Retrieved 23 March 2009. ^ a b Alan Masterson, tictoc design. ""Seafish. On Plate. Fish & chips" (UK Sea Fish Industry Authority website)". Seafish.org. Archived from the original on 11 October 2008. Retrieved 22 June 2009. ^ Nunn, Ian (2011). My Family's Other Recipes: I Didn't Wanna Do It. Author House. p. 121. ISBN 9781467002325. ^ "Fish n' chips, a great Indian delicacy". Times of India. 9 February 2012. ^ "Crispy fish & chips with mushy peas recipe". BBC. Retrieved 7 March 2010. ^ "British Food: A History". Britishfoodhistory.wordpress.com. 23 September 2012. Retrieved 16 July 2013. ^ "How to Eat Fish and Chips like the British". voices.yahoo.com. 16 July 2008. Archived from the original on 15 June 2013. Retrieved 16 July 2013. ^ "Do you know what scraps are? And why they should be free". The Guardian. London. 13 July 2007. Retrieved 24 November 2010. ^ "Serving the Fish and Chips Industry - Nutritional info". National Federation of Fish Friers. 29 March 2018. Retrieved 31 March 2018. ^ "Starting a Mobile Catering Business in UK". Mobilecateringuk.co.uk. Retrieved 16 October 2012. ^ "Chip shops: oh my cod, the plaices I've seen". The Guardian. London. 15 January 2012. Retrieved 2 June 2013. ^ Swillingham, Guy (2005). Shop Horror. London: Fourth Estate. ISBN 0-00-719813-2. ^ "Jakarta Eats: Fish n Chips Shop". Diplomatic wife. 2 November 2010. Archived from the original on 15 April 2012. Retrieved 30 January 2017. ^ "ITICA - Irish Traditional Italian Chipper Association, chippers in Ireland, Irish chippers, Fish and Chip Day — ITICA". Itica.ie. Retrieved 2 June 2013. ^ "Fish and Chip Facts". Barton's Fish and Chips. Archived from the original on 30 January 2012. Retrieved 30 January 2012. ^ "The National Fish and Chip Awards". ^ "Couple scoop best chip shop award". BBC News. 1 February 2006. Retrieved 4 January 2007. ^ "Hudson Valleys Freshest Seafood and Lobster, retail market, restaurant". Gadaletos.com. 16 April 2013. Retrieved 2 June 2013. ^ "Giant fish and chip supper breaks world record". BBC News. 2 July 2011. Retrieved 16 July 2013. ^ "Cod and chips world record battered in Doncaster". BBC News. 29 August 2012. Retrieved 29 August 2012. ^ Gerald Priestland (1972). Frying tonight: the saga of fish & chips. Gentry Books. p. 28. ISBN 0-85614-014-7. ^ "I'll just have me fush and chups and then I'm off to bid". NZ Herald. 24 May 2007. Retrieved 3 April 2018. ^ a b Michael Hogan (19 March 2008). "German Biodiesel Firm To Use Chip Fat In UK, US". planetark.com. Retrieved 1 October 2010. Priestland, Gerald (1972). Frying tonight: the saga of fish & chips. London: Gentry Books. ISBN 978-0-85614-014-3. Walton, John K. (1989). "Fish and Chips and the British Working Class, 1870–1930". Journal of Social History. 23 (2): 243–266. JSTOR 3787879. Walton, John K. (1994). Fish and Chips, and the British Working Class, 1870–1940 (1st ed.). Leicester: Leicester University Press. ISBN 978-0-567-21232-0. Wikimedia Commons has media related to Fish and chips. National Federation of Fish Friers, the UK industry body for fish and chip shops.